As SPECTRE is ready to wrap up principal photography, here’s a look back at some statements laden with irony and hidden meaning that weren’t evident at the time. “John Logan and Sam Mendes have come up with an extraordinary follow up to SKYFALL and we, along with our partners at MGM, can’t wait to share this new chapter with audiences all over the world.” Sony executives Michael Lynton and Amy Pascal in a JULY 2013 PRESS RELEASE. At the time, there was no script. A treatment arrived in the fall of 2013. Logan didn’t deliver a first draft until March 2014. Because of the hacking of Sony Pictures, it’s now known that studio executives were less than thrilled with what Logan (who always said he was working closely with Mendes) delivered. Logan would later be replaced by veteran 007 scribes Neal Purvis and Robert Wade. A side note: bad publicity from the hacks caused Sony to fire Pascal (something she has publicly acknowledged). “At the end of the day, it came down to the story…It was a story I wanted to tell.” This was Sam Mendes speaking on Dec. 4, 2014 to ENTERTAINMENT NOW. At the time Mendes said that, rewrites to fix the last third of the story were being done right up to the Dec. 4 media event that the director hosted. Again, that’s only known because of the hacking at Sony Pictures. “More pressure.” Mendes again on Dec. 4, on how SPECTRE would have a bigger budget than Skyfall and how it would affect him. With the Sony hacks, it’s known the budget had gone past $300 million, making the 24th James Bond film one of the most expensive of all time. SPECTRE, the 24th James Bond film, has been filming in Morocco as the production winds down. The official 007 Twitter feed sent this tweet out on June 28. Not much explanation. There rarely is. Seydoux’s remark is consistent with SPECTRE’s teaser trailer. Naomie Harris’ Moneypenny says to Daniel Craig’s James Bond that he’s hiding some kind of secret after a photo taken during Bond’s childhood was found in the ruins of Skyfall. The Internet series James Bond Radio today debuted a new podcast featuring veteran James Bond crew member Terry Bamber. Bamber worked on Bond films from The Man With The Golden Gun through Skyfall. He’s not involved with SPECTRE (though his wife is a crew member). He was also assistant director and production manager of The Man From U.N.C.L.E. movie, which debuts Aug. 14. Favorite Bond movies: On Her Majesty’s Secret Service (“fantastic film, fantastic film”), followed by Casino Royale and Diamonds Are Forever (“I could watch it over and over again.”) The Living Daylights is “in my top third” of Bond films. First experience on a Bond set: Being taken by his father to the You Only Live Twice volcano set. Favorite Bond: By “millimeters of a point,” Sean Connery. Bamber also makes some brief comments about his work on The Man From U.N.C.L.E. movie, where he was assistant director and production manager on the second unit. The interview lasts more than 90 minutes and covers more ground than this post can really cover. You can listen to the podcast below. The Terry Bamber interview starts around the 17:00 mark. Sony Pictures showed some new footage from SPECTRE, the 24th James Bond film, at the CineEurope event according to THE HOLLYWOOD REPORTER. Here’s an excerpt from the story as it relates to SPECTRE. Warning: There aren’t many details. “Who can forget the last James Bond?” asked Sony Pictures president of marketing and distribution Josh Greenstein to the CineEurope crowds at the studio’s presentation on Wednesday. Skyfall, as he pointed out, earned over $1 billion dollars, but to get the excitement rolling for the 24th 007, Spectre, he introduced Miss Moneypenny herself, Naomie Watts, to debut new unfinished footage that featured the entire top cast of Daniel Craig, Christoph Waltz, Lea Seydoux, Monica Bellucci, Andrew Scott, Ben Whishaw, Ralph Fiennes and Dave Bautista. “For your eyes only,” she told the assembled audience of EMEA exhibitors. Presumably, The Hollywood Reporter meant Naomie Harris, rather than Watts, but that’s what the story says. 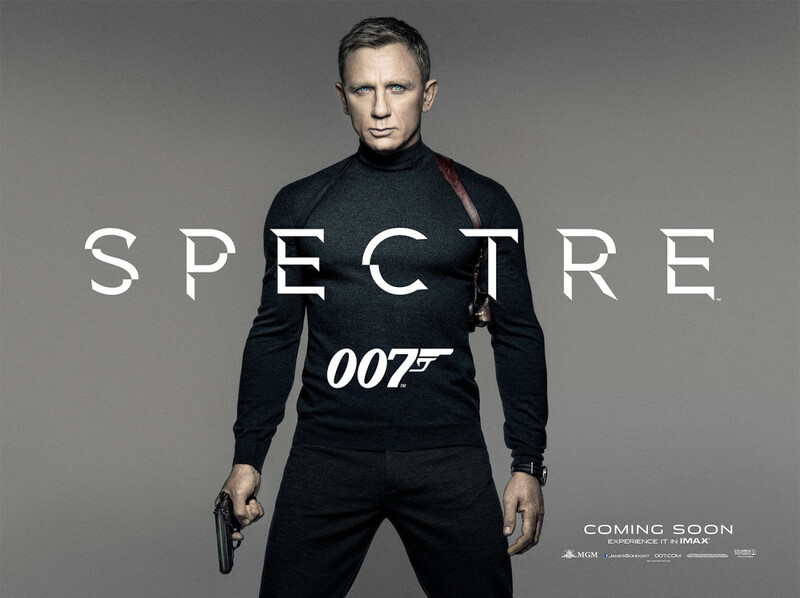 Users on Internet message boards have speculated this may mean a new SPECTRE trailer could be released soon. So far, a teaser trailer has been released as well a one-minute commercial during ABC’s telecast of the NBA Finals. Presented strictly for entertainment value: The U.K. Daily Mail IN A GOSSIP COLUMN BY SEBASTIAN SHAKESPEARE posted June 19, claims that SPECTRE star Daniel Craig has been doing some personal rewriting of SPECTRE’s script. I hear that the 47-year-old actor has been rewriting the script of 007’s latest outing, Spectre, even though filming has been going on since December. To be clear, the Daily Mail has a journalistic reputation that would be tactfully described as uneven. However, the U.K. publication has published a number of 007 scoops proven to be correct. On the other hand, most of those were written by Baz Bamigboye, who has been MIA (as far as 007 stories are concerned) since SPECTRE went into production Dec. 8. The only reason we mention this is because SPECTRE has had a dicey scripting process. The first writer was John Logan. Because of the Sony hacking, it’s now known Logan’s initial efforts contained some questionable ideas. Logan was replaced by 007 veterans Neal Purvis and Robert Wade (something that Bamigboye originally reported last year), with some polishes by playwright by Jez Butterworth. Also, it should be noted that Craig said in 2011 he and director Marc Forster did uncredited rewrites for 2008’s Quantum of Solace. This was an unusual week for SPECTRE. The marketing effort for the 24th James Bond film zigged one way but the Internet zagged in an entirely different direction. The week began with a video blog showing behind-the-scenes footage during SPECTRE’s shoot in Mexico City back in March. That’s understandable. The Mexico City sequence opens the film (the filmmakers have disclosed this, so it’s not a spoiler). It’s going to be expansive, so the short video sought to give the viewer an idea of that without giving any plot details away. The Internet, however, refused to be gently guided in that direction. Bookmaker William Hill in the U.K. decided to alter its odds for the actor succeeds Daniel Craig as Bond. Craig said back in 2012 he was contracted for two films. That would mean he’s on board through Bond 25. That would indicate, there won’t be an actual vacancy until 2018 or so. Nevertheless, the bookmaker moved actor Damian Lewis to 3-1, generating stories in familiar trade publications such as THE HOLLYWOOD REPORTER and VARIETY as well as outlets such as THE TELEGRAPH and ENTERTAINMENT WEEKLY. Even The Atlantic, which normally analyzes weighty and serious matters, DID A STORY that used the William Hill news as a news peg to also examine whether the next 007 should be black. In any case, Indiewire took the whole thing a step further. It asked readers to PARTICIPATE IN A SURVEY about who should be Craig’s successor. (Indiewire calls it a poll, but it’s not. An actual poll employs statistical methods in selecting its sample of respondents. This is just click on whoever you want to be 007.) Anyway, there were turn out the vote efforts by fans of potential future Bonds. It’s probably safe to assume the folks at Eon Productions and their studio partners at Metro-Goldwyn-Mayer and Sony Pictures are not real happy about this turn of events. MGM and Sony are ponying up $300 million or more and, no doubt, would rather have the public concentrate on the upcoming SPECTRE due out in November than the next re-casting of Bond, whenever that occurs. In the 21st Century, the Internet sometimes has a way of not cooperating with movie marketing.